Cohu, Inc., headquartered in Poway, California, encompasses three different companies or subsidiaries. From the humble beginnings of a tinylaboratory partnership in 1945, the company has grown throughout the last 60 years into a company that employs approximately 800 employeeswith $200 million in annual sales revenue. Cohu, Inc. U.S. operations include Delta Design, Inc., a leading supplier of test handling, burn-in andthermal solutions used by the global semiconductor industry; Broadcast Microwave Systems, Inc., which produces microwave video equipment andantennae systems; and Cohu Electronics, which manufactures closed-circuit television surveillance equipment. The subsidiaries within Cohu were experiencing many challenges with thevarious products they produced and the industry segments they serve. DeltaDesign had implemented LeanManufacturing principles in their manufacturingoperations in 2004. They now wanted to expand their implementation bymaking additional improvements in quality, increase first pass yield andincrease service to their customers. Broadcast Microwave Systems wasexperiencing significant growth in their business and needed to reduce leadtime, increase product quality and increase profitability for their operations inorder to remain competitive. During a needs assessment conducted with the senior management of DeltaDesign, Inc. and Broadcast Microwave Services, Inc., it was determined thatquality, productivity and profitability could be improved by implementing LeanManufacturing and Six Sigma Green Belt practices in both organizations. The project was conducted between January and April of 2009 with trainingbeing delivered to participants. The CMTC consultants provided training in thebasics of Lean Manufacturing principles and tools including 6S, VisualManufacturing, Cellular Flow and Pull/Kanban Systems. The training CMTCconsultants provided was interactive with participants working on groupprojects on their own factory floors implementing the concepts as they werelearning them. This allowed the employees to have a personal connection to thetraining material and practical application. The Six Sigma Green Belt Training included the training and the application ofthe Six Sigma tools to internal projects. The employees gathered data,conducted analysis and each group reported on their results throughout thedifferent phases of the class. This enabled the employees to put the Six Sigmatools into practical use by experiencing how the tools work in solvingproblems. The training provided a common problem-solving methodology and languagefor addressing ongoing improvement projects for the company. An enhancedwork environment was created because employees were involved in thedecision-making process in the areas they worked in. Employees were heldaccountable for sustaining the changes made and were motivated to developand implement new continuous improvement initiatives. Savings were accruedfrom reduced production time and improved product quality yield. Thesebenefits were in addition to the continuous improvement skills gained by theteam members who worked on the various projects. Cohu, Inc. received the 2009 San Diego Chapter,American Society of Training& Development (ASTD) P.E.A.K. Award in the manufacturing business sectorbased on the success of the project to their business. This award honorsoutstanding learning and performance achievements. Award emphasis wasplaced on recognizing those learning and performance initiatives whichexemplify Performance Excellence and Applied Knowledge. The project resulted in Broadcast Microwave Systems achieving a 10%reduction in production assembly time and a 25% increase in throughputcapacity. 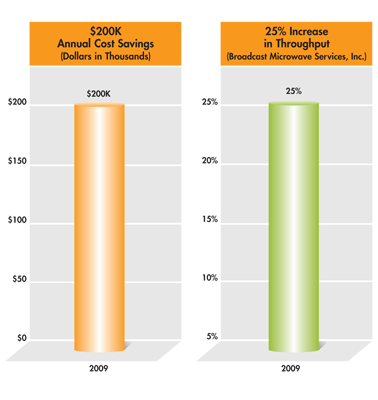 These improvements enabled Broadcast Microwave Systems toincrease sales revenue by approximately 27% using existing facilities andresources. In addition, a $15,000 initial cost reduction in non-value added waittime was achieved on their initial project. At Delta Design, the first passproduct quality yields were increased by 50%. These improvements resulted inannual cost savings of over $200,000 due to increased productivity, increasedfirst pass yields and more efficient operations. Delta Design was able to retainapproximately 50% of their sales. Both operations were able to retain jobs andadd three new employees. "The enthusiasm imparted during the training carried into the pilot effort on the factory floor. The resulting empowerment created a springboard for rapid improvement. CMTC staff, practices and expertise are World Class."